After getting some much needed sleep, I can finally share with you the incredible experience I had this past week meeting choirs, conductors, composers, and administrators from all over the globe at the Podium Choral Conference & Festival held in Edmonton, AB. 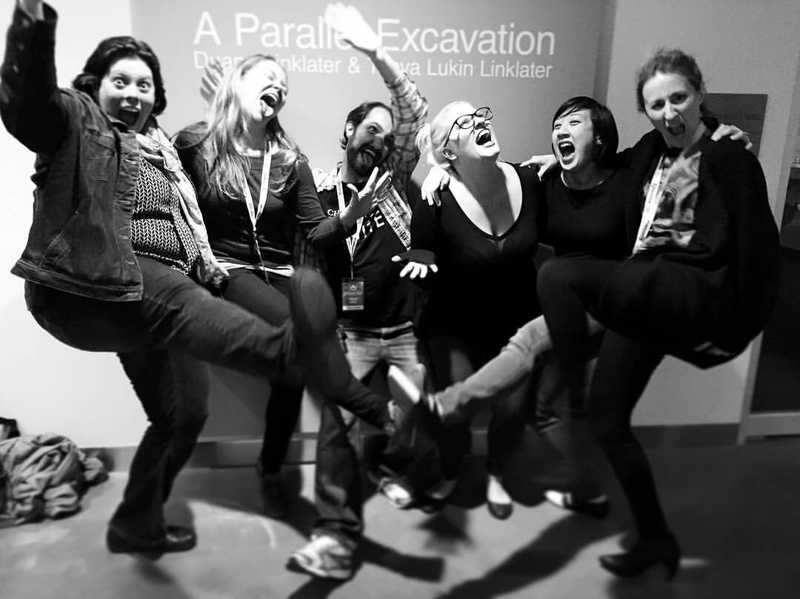 I had the opportunity to be part of the social media team where I tweeted and Instagram'd the conference and festival events to the point where I was a downright insomniac. I was so thrilled to see how many choral lovers were saturating downtown Edmonton with spontaneous bouts of singing, conducting gestures and #choirography, which made my phone blow up constantly with #Podium2016 mentions around the clock. 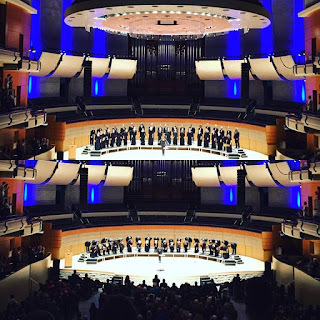 Being the first conference I would attend, let alone a choir conference - I wasn't sure what to expect but I did know my one goal was to be exposed to all the choral works performed by the featured choirs invited to Podium. I was not disappointed. The quality of sound from the choirs was top notch, especially the youth choirs! What I didn't expect from Podium was the ease of accessibility in meeting the giants and prolific leaders of the choral world - Paul Mealor, Bramwell Tovey, Conspirare with Craig Hella Johnson, Michael Zaugg with Pro Coro Canada, Morna Edmundson of Elektra Women's Choir, and Julia Davids of Canadian Chamber Choir. To have that access for open conversation with them was incredibly liberating and gave me the chance to tell them how their craft has inspired me. 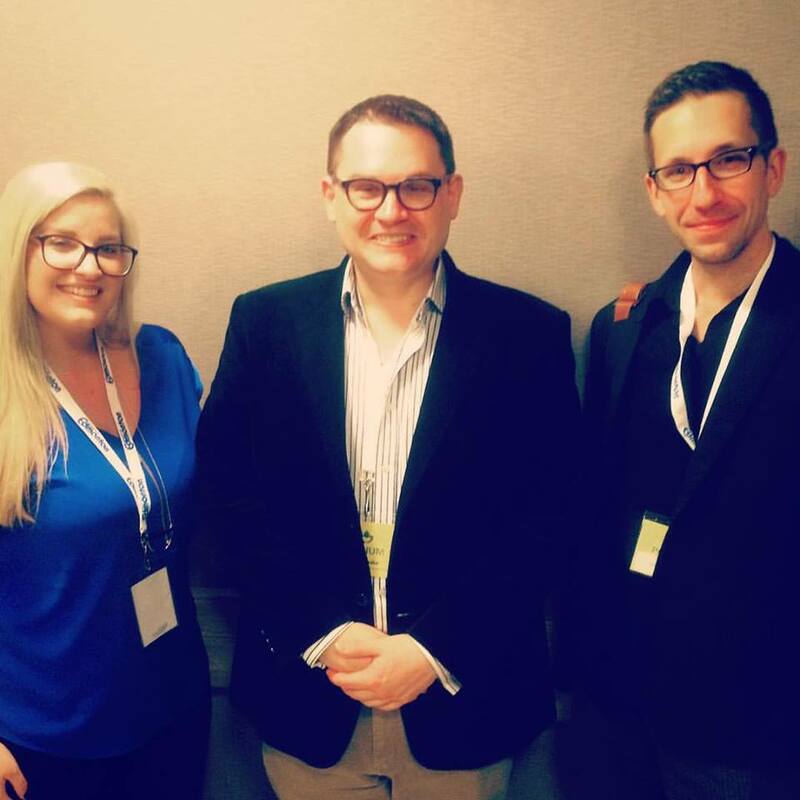 It was particularly groundbreaking for me to meet Paul Mealor, whom I've sung much of his repertoire both as a chorister and soloist, most recently the epic Stabat Mater with the Capital Chamber Choir and soon to reprise the alto solo in Salvator Mundi: Greater Love this summer. His music made an impact on my life and growth as a singer and the fact that I had the opportunity to tell him in person meant a great deal to me...and I thank Podium for that. 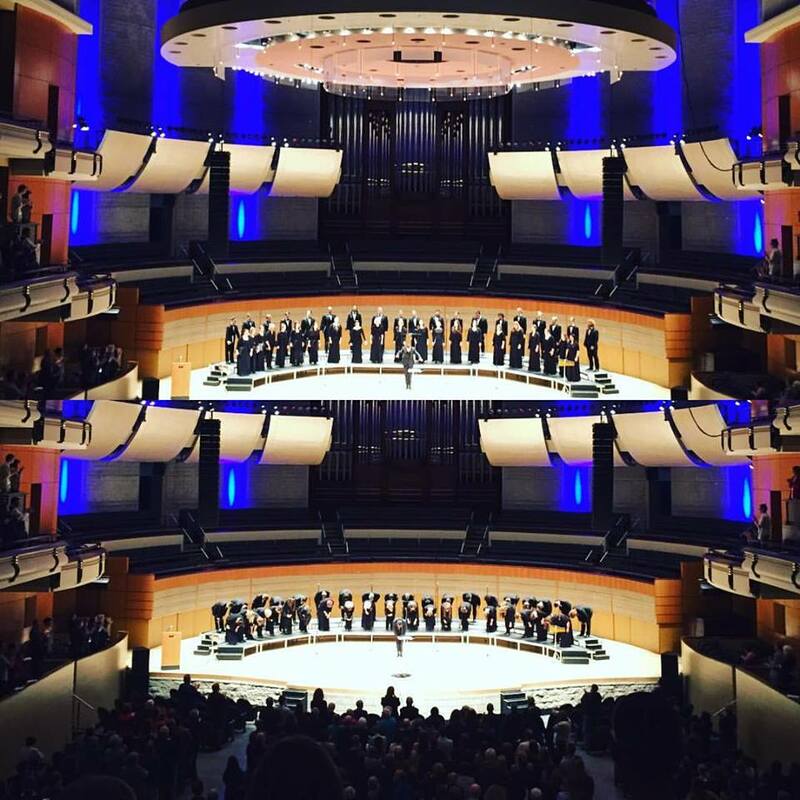 Coastal Sound Youth Choir from Coquitlam BC, led by Carrie Tennant performed both at the Voices West concert, Podium After Hours, and as a spotlight concert which blew me away. The energy, fun, and powerful messages in their repertoire kept the audience completely engaged and emotional. One piece in particular certainly struck a chord - the world premiere of "A Prayer for a Child" by Pärt Uusberg, poem by Dr. Seuss. Everyone in the audience had a picture of a child affected by war (Anne Frank, Zahra Mahmoud etc.) on the back of their program. Throughout the piece, pictures of the children began to emerge from the singers hands. With Carrie's signal, the audience also raised the pictures to the crowd during the most powerful section of the piece. The best part? 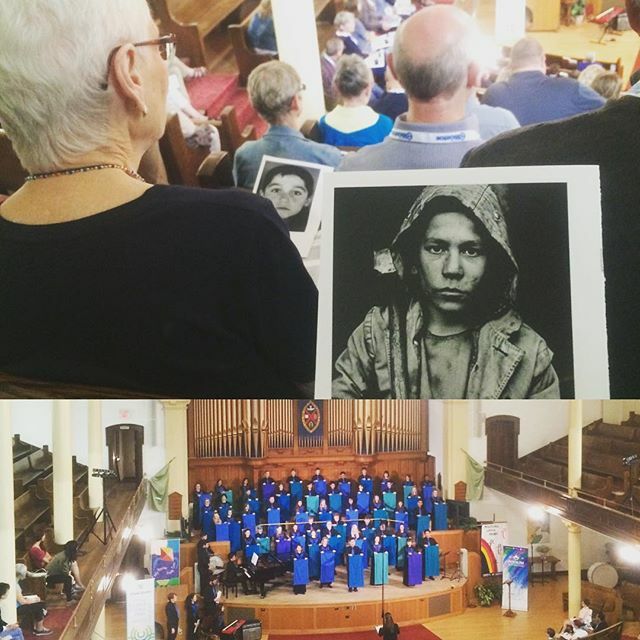 The choristers were all wiping away tears as they sung, clearly affected by the music and message they performed. To see them grow before us in song was an amazing thing to witness. Update: CSYC now has a video of the performance! 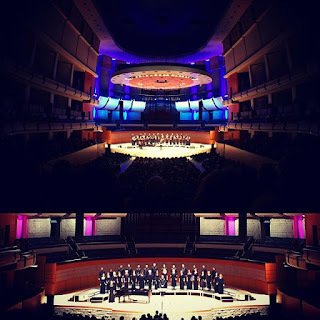 Voices West opened the festival at the beautiful Winspear Centre for Music (a chorister's dream concert hall btw) with gorgeous repertoire and fun choirography that entertained the crowd. Two pieces worth mentioning was the "Motherless Child" by Allison Girvan performed by Corazon with their intense and reflective movement on the stage. 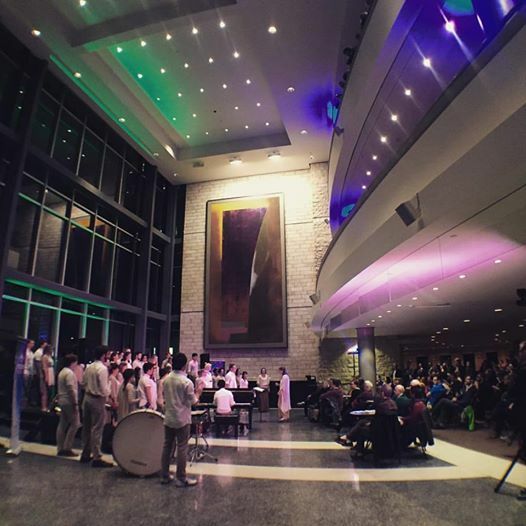 The other piece which was something I've never seen before was the "Hymn of Axciom" by Vienna Teng, performed by Coastal Sound Youth Choir and Kokopelli Choir sung in complete darkness in the hall. "Teng uses the piece to capture the way people related to technology and the information gathered about them, and there's almost a religious quality to it. "I think the reason we agree to be spied on, basically, is that, on some level, we do want to be known," she says. "There is that unsettling parallel with religion and the way technology works now. At some level, as human beings, we have this deep need, this deep desire to be understood, to be seen, to have the sense that someone knows everything we do. NYCC performed of such high caliber under the baton of Michael Zaugg with the opening piece "Raua Needmine" by Veljo Tormis with Zaugg banging away on the drum. I suggest you listen to this piece to understand why it stood out to me and made for an unforgettable opening of a concert. Gotta start with a bang! We certainly can't forget the commissioned repertoire, notably Kristopher Fulton's "O Seeker of Dreams" and Cy Giacomin's "The Centenarian" which were both incredible and added to my repertoire wishlist! After realizing all my Tarik O'Regan go-to YouTube clips for score studying was all recorded by Conspirare, I knew I had to see them live. They have incredible sound and a soprano section choirs would kill for. There's nothing more satisfying than hearing high sopranos floating and spinning in the high register so effortlessly. Their ode to the music of Stephen Paulus was particularly beautiful, especially the "Poemas de Amor" which is also on my repertoire wishlist! Coming back to Tarik O'Regan, we had the pleasure of hearing the world premiere of his new work "Turn" which was also an audience favourite! One piece I still cannot get out of my head is their arrangement of "Light of a Clear Blue Morning" by Dolly Parton. I generally don't dwell on popular music arrangements but this rendition was so uplifting, delicate, and ended on the right note (no pun intended) for me at that moment. It also shows the sheer versatility this choir encompasses. 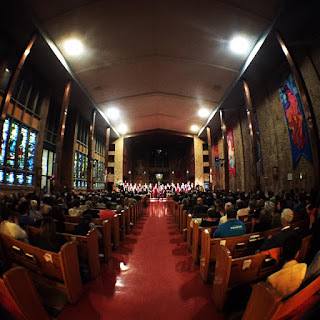 Pro Coro Canada performed some incredibly difficult pieces such as Ligeti's "Lux Aeterna" which is a testament to the skill and musicianship of this choir. They also premiered two new pieces - The choir's Composer-in-Residence, Paul Mealor's "To Seek where Shadows Are" and an uOttawa fellow alumnus, Robert Rival's "L'Aube". This will not be the last time we hear these compositions as they were truly popular by the audience full of choral lovers! I already miss this crew of fun, fabulous people who introduced me to Cat Paint, fangirled with me at the Winspear Centre, shared my social media insomnia feelings, and intense chats about choir insurance! 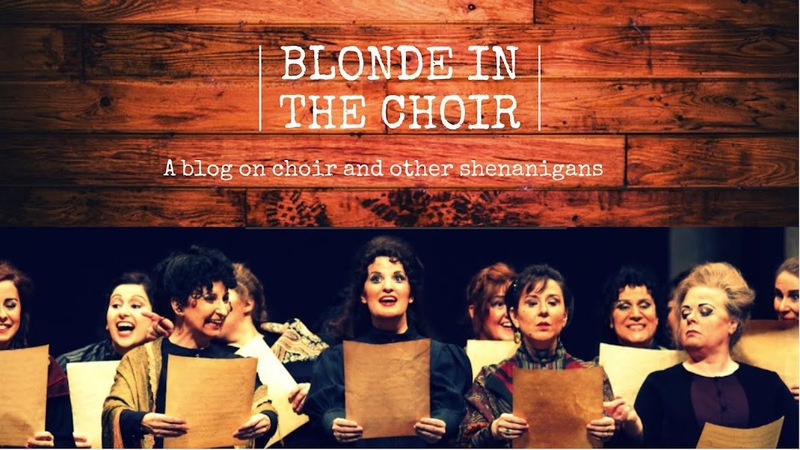 It was amazing to share the social media platform with my fellow Choral Avengers under the tireless leadership of Sable from The Choir Girl Blog. I miss you all and am proud of the work we did in connecting the choral world via social media. #Podium2018 in St. John's, NL we're coming for you! 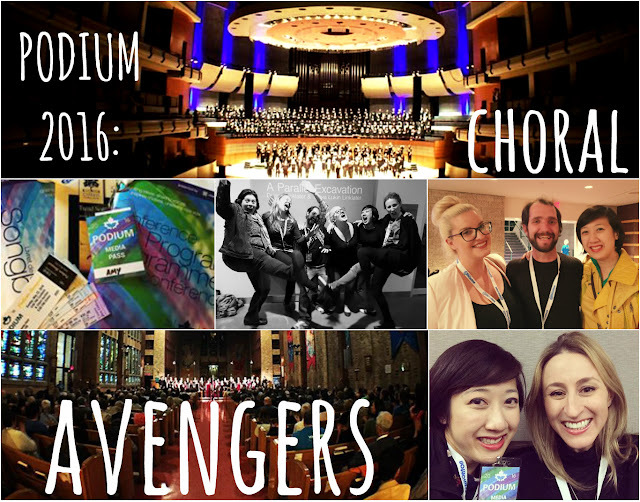 In a nutshell, I truly believe all choral lovers should experience Podium because it is five days of forming great connections, learning, networking, exposure to new works and choirs, and most of all..bonding over our love of choral music in unison (pun intended)! 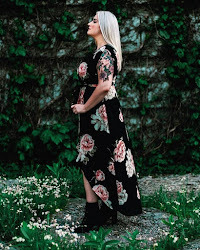 Love this post, Amy! Thanks for being a part of my team and taking me up on my crazy offer to fly across Canada and get up to some choral music shenanigans!